Many of you already have e-book readers or iPads. It is intuitive that these can have valuable applications for those learning or keeping up languages. This is a complex subject, especially since the area is in rapid evolution and the availability of e-reading is pretty new to Italy. 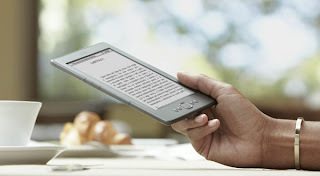 Barnes and Noble Nook and the iPad are a possibility for reading in Italian, but I think that at this point your best bet is to go with Amazon and its Kindle, as Kindle Italia recently became available. Now. There are two major potential ways for reading Italian from your Kindle: first, go to the original (American) Amazon and get Italian materials from there. I can already tell you that the selection at present is limited and will mainly be of use to those of you who are learning Italian, not those who can read books with facility. An excellent perk is that if you also upload an Italian dictionary to your device, you can then see the definition of the word while you're reading (if you need to). This saves you from having to stop and look the word up in a paper dictionary, the bane of foreign language readers everywhere. Now is a good time to acquire a Kindle, as prices are coming down. Here in the States, the new basic model is now $79. Well worth it if you're a language learner- and don't forget that you can also buy language learning material too, not just books. If you want to check out the various models, you can go to a retail store in your area. Here in Boston I believe that Target, Radio Shack, and Best Buy have them. Wal-Mart also carries them. Le comunico che, se lei risiede negli USA potrà acquistare i contenuti Kindle unicamente su Amazon.com. Le confermo inoltre che i contenuti digitali scaricati da tutti gli Store Amazon sono compatibili con tutti i dispositivi Kindle e applicazioni di lettura Kindle. L'azienda più attenta al cliente del mondo. In other words, you can only buy the content for your American Kindle from American Amazon while you are in the States. Strangely enough, as the customer rep guy says, this is not a problem of technical incompatibility but of commercial practice. Which means it might change in the near future.